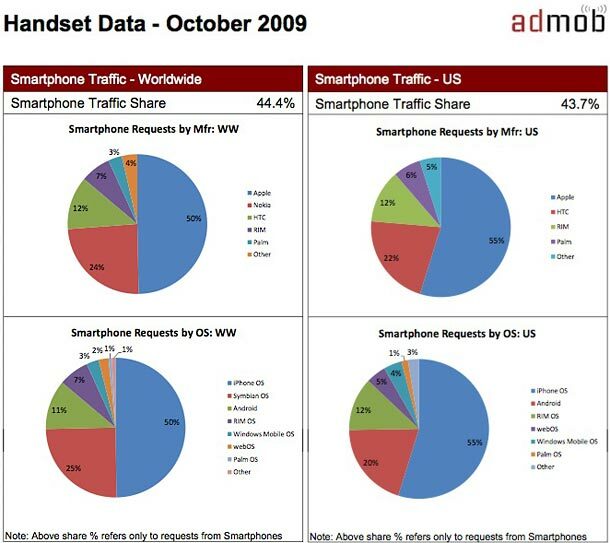 Symbian (nokia) accounted for 46% of all sales in October and yet their customers account for only 25% of all traffic. Nokia is content to sell cheap telephones and it wouldn’t surprise me if texting accounted for most of their traffic. Microsoft (winmo) accounted for 9% of all sales in October and 3% of the traffic. Microsoft lost its way and is dwindling in this space. Do you suppose they’ll come to market with a Zune phone powered by winmo7? Or will they give up on hardware? Apple accounted for 18% of all sales in October and 50% of the traffic. Apple only sells smartphones and are having the greatest impact on web traffic. Clearly the trend is towards pocket computers. I myself no longer use the desktop for email and surfing, that duty has been absorbed by my Touch. RIM dabbled in the smartphone market but all indications are their customers are buying conventional devices. It’s obvious their OS is probably capable, but RIM is out of their league when it comes to hardware design. Don’t they have something like 24 different models? The support for that many SKUs has to be a financial drain on the company, no? The two are quite different scales of economy. It’s much more affordable to buy the best phone than it is to buy the best car.